Observation - Orange Ladybird - UK and Ireland. 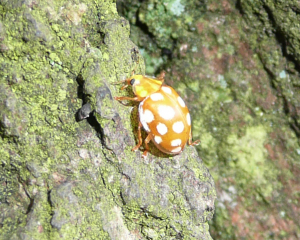 Description: Orange with white spots about the size of a large ladybird.Found on Oak tree when looking for lichens. Orange with white spots about the size of a large ladybird.Found on Oak tree when looking for lichens.